Violent, relentless and aways waiting for the kill, the deadliest terror of the sea returns this summer in rip-roaring thriller Shark Killer. When one of nature’s most ruthless creatures threatens your beach, there’s only one man to call: the lay-about ladies man, Shark Killer Chase Walker (Derek Theler, Baby Daddy). So when a precious diamond becomes lodged in the belly of one of these flesh-ripping beasts, the man who wants it knows who to go to. The hunt is on. Enlisted by his brother, Chase endeavors to retrieve the diamond in the greatest challenge of his career yet. Keeping a close on him is Jasmine (Erica Cerra, Eureka), his brother’s girlfriend, and as threats from a rival crime boss played by The Mummy‘s Arnold Vosloo, draw closer loyalties start to shift. When the blood starts flowing and the sea starts churning, Chase will have to go deeper, fight harder and kill with absolute finality if he is to survive. 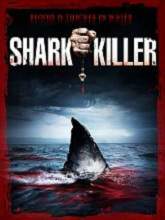 Get ready for sun, fun, and shark attacks as man takes on beast in Shark Killer, diving onto DVD July 20, 2015, courtesy of Image Entertainment. Forget Sharknado, it’s time to get back in the water with Shark Killer. This entry was posted in Necropolis News and tagged Derek Theler, Image Entertainment, Necropolis News, News, Release Date, Shark Killer. Bookmark the permalink. The Sky Has Fallen (2009): A Macabre review.